OK, just hold that front page for a minute, I’ve got a scoop here. There’s more than one band in Croydon attracting attention and I want to be the first to say I’ve discovered the Croydon Scene, so just remember where you heard it. We reviewed the Yeti Love single a few weeks ago and now we’ve got another Croydon band, CoffeePot Drive, releasing their first single “Hey Suzy”, which you can hear on the link above. The band’s sound harks back to a time in the late sixties and early seventies when blues, funk and soul regularly crossed over, creating interesting hybrids with funky guitar riffs, Hammond B3s and soulful vocals. 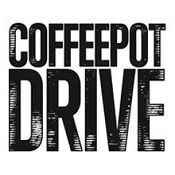 The members of CoffeePot Drive have worked in various line-ups on the live circuit in the past and the quality of the playing shines through, particularly in the guitar interplay; it could easily be early Fleetwood Mac or The Black Crowes, but there’s a very special ingredient. The voice of Lady Oracle softens the hard edges of the guitars, supplies layered backing vocals and cuts through at the high end of the frequency range. There’s a nice use of dynamics as well, with the breakdown at the two-thirds mark where everything drops out except cymbals and guitar arpeggios before building back up through a couple of choruses to a guitar and vocal coda. As a lead track for the album, it works well; it grabs the interest with the guitar and vocal interplay and leaves you wanting to hear a bit more. Job done, I think. “Hey Suzy” is released on August 17, with the album “Edge of Town” following on August 31.